'Prisoner' Is An Intimate Portrait Of Journalist Jason Rezaian's Captivity In Iran Writer Jason Rezaian is unsparingly personal throughout the telling of his arrest, imprisonment and trial, writing of his childhood, family, visits with his wife — and fears and insecurities. In 2009, a young American named Jason Rezaian moved to Iran to be a foreign correspondent. His family's rug business in northern California had gone bust and Rezaian decided to take a chance at something new. A lot of foreign correspondents begin their careers this way, going someplace no one else can or will, selling their work to any news agency that will pay. The best of these, like Rezaian, often end up with real jobs. For Rezaian it was at The Washington Post, which hired him in 2012 to be its Tehran correspondent. Two years later, the Iranian government arrested Rezaian, claiming he was an American spy. 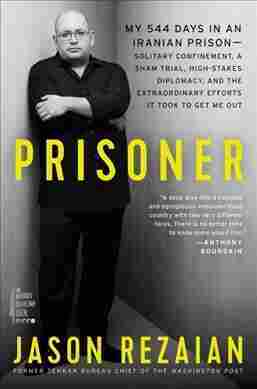 Prisoner is Rezaian's story of his arrest, imprisonment, trial and eventual release after 15 months. It's also a revealing account of his childhood, family and marriage. Perhaps mirroring how he was left to his thoughts in prison, the narrative is digressive, jumping back and forth to different periods of his life. And it works. "It was a Tuesday afternoon in Tehran in the middle of Ramadan," he begins, in the spare style of a big-city police reporter. Rezaian's Iranian wife Yeganeh — whom he calls Yegi — is upset by an anonymous email demanding money, or "'we'll expose you for the whore that you are.'" There have been other disturbing online episodes as well, and his wife wants to leave Iran early for a planned vacation. But Rezaian decides to keep to schedule in order to attend his mother-in-law's birthday party that evening. They are nabbed by security agents in their building's parking garage. "When the elevator door opened," Rezaian writes, "there was a guy standing there with a gun pointed at me. There was more than one guy, but I just remember the one with the gun." Rezaian's relationship with Iran — like his arrest — is at once simple and complex. His Iranian father, a graduate of San Francisco State University, married an Illinois girl he met in school and remained in the United States. Rezaian and his older brother Ali grew up in Marin County with an extended network of Iranian friends and relatives. He describes his move to Tehran as an almost inevitable "reverse migration." There he found professional success — and Yeganeh. Yegi and Jason's arrest wasn't without context: It came during negotiations over the Iran nuclear deal and was carried out by the Islamic Revolutionary Guard Corps. The hard-line group opposed the nuclear agreement, and Rezaian believes he was a hostage to the internal Iranian political dispute. His wife was released about two months after their arrest, but Rezaian remained in prison. One $20 contribution came from an acquaintance at the U.S. Department of State. Rezaian's interrogator seizes on this detail: "you are head of CIA operations in Iran. This is our proof that you are what we say you are." "I tried to further explain Kickstarter and the significance — or lack thereof — of avocados, but blindfolded and under duress in Farsi, and speaking to an unknown audience, I had reached the limit of my capabilities," Rezaian writes. But of course Rezaian's arrest was deadly serious. He spent two months in solitary confinement, cut off from the world and warned by his interrogators he could be in prison for 25 years — or executed. His family, The Washington Post, and Secretary of State John Kerry were all working hard for his release — but it was months before Rezaian knew any of that. His account of how he learns that he has become an international household name is characteristically wry. By then, Rezaian is sharing a cell with an Azeri prisoner, who becomes a close friend, and a television, which they watch for hours a day. "In prison," he writes, "especially if you have no idea how long you'll be there, your aim isn't to kill time, it's to conquer it." And "the best time waster is a television." About two months into his captivity, watching a state TV newscast with his cellmate, Rezaian is flabbergasted to see Post editor Marty Baron confronting Iran's President Hassan Rouhani about his imprisonment. His interrogators had told Rezaian the world had forgotten him. Ultimately there is a trial and Rezaian is unsurprisingly convicted. His judge is "without exaggeration, one of the dumbest people I have ever encountered." It is "a secret trial with no secrets." A complex agreement between governments is reached to allow Rezaian's departure. But at the airport there is one final drama — told in riveting prose — when Iranian authorities refuse to allow Rezaian's wife and mother-in-law to leave with him. He refuses to go and the authorities relent. "Yegi and I misplace things. We get agitated about it. I'm pretty sure it's temporary. She's a perfectionist and gets angry at us. We've aged. Neither of us trusts anyone anymore. But we trust each other. We've been through too much together not to. I become confused in crowded places. I don't like talking on the phone. I get recognized when I least expect it, by people who I still can't believe know who I am. It's never as comfortable as I make it look." Rezaian is unsparingly intimate throughout, writing of his fears, his insecurities, of the conjugal visits with his wife allowed by the Revolutionary Guard (in accordance with Islamic law, they tell him). His experience of prison is traumatic but he is never physically tortured and relations with his interrogators are described as oddly amiable. Rezaian comes off as a guy one would like to have as a friend, and it seems the Iranians think so, too. Rezaian's interrogator, Kazem, is among those at the airport to see him off. "I stared at Kazem for a long time, until we both smiled. Then I did a crazy thing. I hugged him. Yes, it's even possible to develop an attachment to your tormentors, and no, a------, that's not Stockholm syndrome. It's called being human." Mark Katkov is an editor at NPR.